Stainless steel, mirrored fountains with etched glass. Free standing floor fountains, both mirrored and transparent. Modern fountain designs that utilize LED displays are just one expression of the direction in which fountains are moving. You can customize the glass used on these fountains with the logo, phrase, or image of a business or public space, and further customize the colors of the LEDs themselves. The actual frame and border of the indoor water feature will be entirely up to the customer, but you can even choose an “invisible” border to give the appearance of a floating water feature in the open air. These LED installations are the perfect alternative to static plaques and framed posters, which may not reflect the cutting edge personality of your space or business. As an installation for commercial spaces, logo fountains are hard to compete with. When placed in a reception area or lobby, a logo fountain can provide a visual design element that guests, employees, or customers will find elegant. As with other indoor fountains, you can choose the border and base of the fountain to get the perfect match for your design aesthetic. The Adagio Summit Falls Wall Fountain with Mirror is a perfect example of a water feature that you can place nearly anywhere in a commercial space where you want your logo to be noticed. Other options, like the Adagio Teton Falls Wall Fountain with Mirror, can greet your visitors as they enter a lobby, and can act as a sign that your business has both achieved much and plans to do much more. 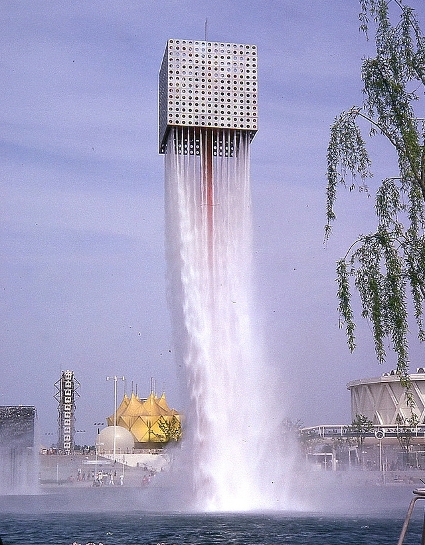 Finally, there are few installations that are quite as dynamic and impressive as the free standing floor fountain. Floor fountains are designed and installed with the same care as their wall mounted counterparts, but additional care is taken with their base and ceiling support. These fountains can be placed virtually anywhere, and like logo fountains, can also be etched or installed with your company's logo or name. Perfect for the entrance to a meeting room or the center a lobby, a free standing fountain like the BluWorld Gardenfall Bamboo Floor Fountain or the Black Slate and Glass Floor Fountain provide a highly modern and sophisticated design element that both commercial and residential property owners will fall in love with.